Welcome to the website for Ballantrae Parish Church linked with St Colmon Parish Church, a charge of the Church of Scotland. 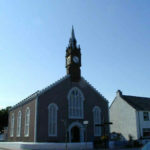 Ballantrae Parish Church meets at 11:30am every Sunday. Services are also held on the first Sunday of the month (April will be 2nd Sunday) at 3pm in Glenapp Church. This a liturgical and ecumenical service led by a dedicated group from the congregation of Ballantrae. All the services are times of fellowship, prayer, worship and reflection on God’s word, as we get to know the living God more.